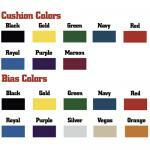 Please call Mon-Fri 10-6 EST for options, pricing and availability, certain colors may ship asap. The CP 24SW is a FLAT design! The 24SW is the newest designed shoulder pad for Quarterbacks, Wide Recievers and Defensive Backs. 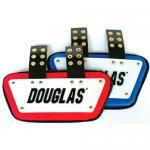 The Custom Pro Pad is Douglas' finest series. This Lightweight, low-profile, streamlined design allows for maximum range of motion. The 24SW comes standard with super-shaved sc18, reverse cups, ¾ inch Hinged-Main Body, 1/2 inch top redundant, removable channels, 1 inch belts and buckles and a swivel front. 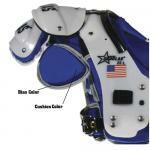 Webbing attaches both the flaps and cups allowing increased flexibility for all skilled positions. 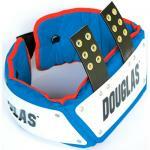 Douglas can turn an ordinary player with ordinary equipment into one with a competitive edge. The Douglas Edge. Flexibility, durability, comfort and protection. Wear what the pros wear. All CP series pads are made with white plastic. This innovative system uses lightweight open-cell foam to disperse the impact of a blow away from the player's body. 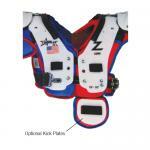 Custom Pro shoulder pads requires 4 weeks before they can ship out. Rush option available. 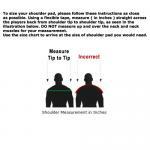 Have your shoulder pads shipped out in 3 to 5 days. 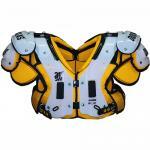 Custom Pro shoulder pads that are returned or exchanged will be assessed a 20% re-stocking fee. Rush fee is not refundable.